Almost everyone would like to have a spacious, luxurious bathroom, but sometimes there is no economical or convenient way to add space when renovating small bathrooms. Here are some small bathroom remodeling tips that add space. You can pack a lot of efficiency and a sense of openness into tight spaces through thoughtful design and clever small bathroom layout and construction. The challenge is to maximize apparent floor space while accommodating the trio of necessary bath items – toilet, sink and bath and/or shower. Those three fixtures demand a large portion of square footage, but much space can be gained or maximized in other areas. Whenever possible, rearrange fixtures to improve traffic flow and eliminate wasted space. Bathroom corners often present big opportunities to capture space. Replacing a full-size tub with a corner tub can provide as much as 33 percent more floor space. Corner vanities are another way to maximize that often-wasted area and open up the floor. 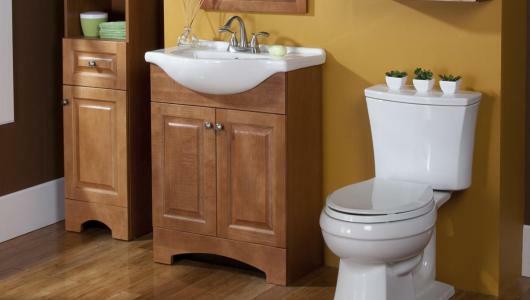 Wall-mounted toilets and sinks can fool the eye, making the floor space look much larger than it really is. Typically, vanities are 21 inches deep. Consider replacing these vanities with narrower ones with bump-outs at the sink. Narrow vanities can be as little as 12 inches deep except around the sink, and while that extra 9 inches of floor space may not seem like much, it definitely makes a difference. Consider reversing the bathroom door to open out into the hallway, or install a pocket door or bi-fold door to increase usable space around the entry. Remember the door opening must be at least 32 inches wide to meet accessibility codes. This is one of the basic small bathroom remodeling tips. The standard bathroom storage package consists of a vanity, medicine cabinet and maybe a linen closet. Often there’s a decent amount of bare wall space in any bathroom, and that represents lost storage opportunities. Any wall not covered by a shower, sink or toilet is a storage opportunity waiting to be built. Utilize those walls with bathroom-style cabinets that are shallower than typical kitchen cabinets. Also consider the space between the studs of an interior wall as another opportunity – how about a floor-to-ceiling medicine cabinet built into the wall? Cabinet organizers can provide better organization and therefore more space in the bathroom. Pullout trays and basket-style organizers are clever and handy. A relatively new cabinetry item is the wrap-around drawer directly underneath the sink. The drawers have a U-shaped cutout that fits around the underside of the sink and provided neat and clever storage. After you’ve utilized the space in every nook and cranny of your small bathroom layout, find ways to create the sense of more space without actually adding it. Adding natural light with a window, skylight or tubular skylight can create the illusion that a space is larger than it really is. Plus it can have the added benefit of improving ventilation. Install blinds or privacy glass. Use reflective surfaces that increase light in the room. Matte and opaque surfaces can make a space feel smaller. Install frameless glass shower doors. Place mirrors in other areas, as well as above the sink. Carefully placed mirrors provide a sense of openness and multiply lighting. Plus, most design experts agree that light monochromatic color schemes make a space appear larger.